Look! A crowd. Always a welcome sight when it comes to food in Asia. 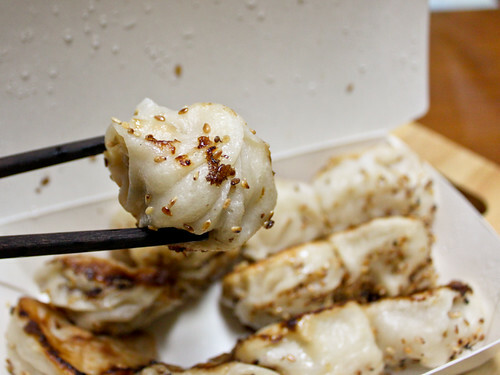 Yes I'm sure this post feels kinda like deva ju since it seems I just wrote about these baby pan-fried pork buns last month, but this cart is different (ha, I feel like I write that all the time). 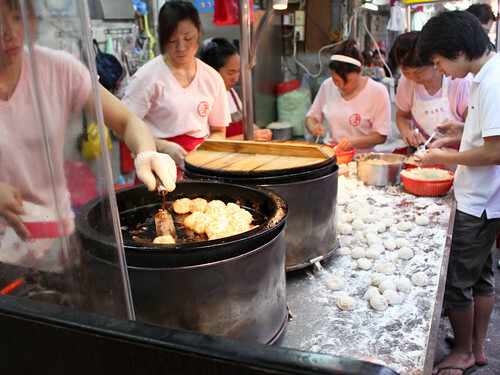 Nope, in the case of the Shilin Night Market shop, their buns were moderately thick skinned, juicy pockets of pure pork. A meat bun at its finest. 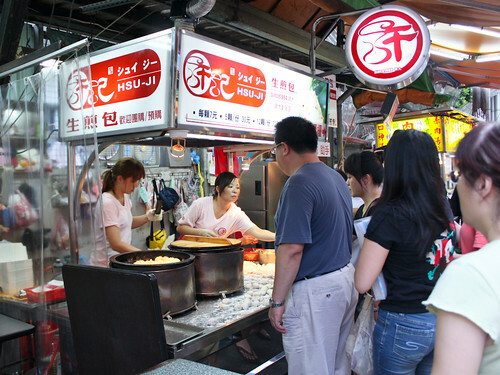 This cart 許記 (Xu Ji), found nestled in 師大夜市 (Shida Night Market), has a slight twist on the interpretation of 生煎包. 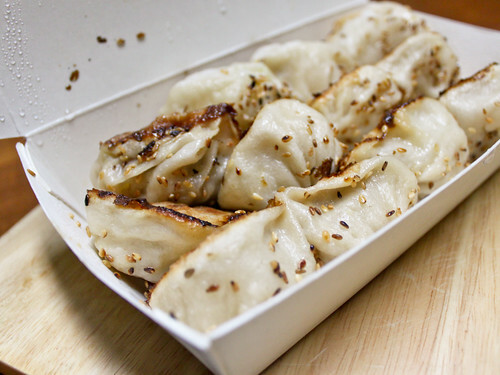 They use a skin only marginally thicker than that of a soup dumpling and fill it with a blend of pork and cabbage, half and half, resulting in what can basically be considered a juicier, fatter potsticker. Interested yet? Know how much the box of 12 cost? All of 72 NT ($2.25). If you think about this on a per bun basis, that's 6 NT for a bun/dumpling hybrid that could put most places in the US to shame. That's less than 20 cents per bite of sunshine, happiness, and everything that's good in the world. It's less than a quarter for 20 seconds of pure bliss. It's like a gateway drug of sorts, except instead of getting arrested, you just get fat. A closer look, just so you can appreciate the subtle charring that's present across every single one of these puppies, uniform too. The glistening of the skins should give an indication of just how moist/oil-laden these fried buns are, and I think the juice content should be somewhat obvious given the shape as well. If anyone's wondering which place is better for 生煎包... there's no comparison, these two aren't replacements for each other, they're both spectacular in their own way. Side note... I've become a champion of ambidextrous chopstick usage since I need my right hand for pictures. Thanks food writing, useless skill attained! IT'S WUT I DO. Nah, I get bored waiting for classes, so draft and publish posts in my downtime. These things are good enough to make me want to curl up in a little ball and cry though. I read some of your articles carefully and your content can be really for our readers looking for activities and places to eat in Taiwan ! I'm convinced that Weekend.com.sg users would love your humorous food philosophy haha ! In consequence, I decided to select your blog ! I would like to know if you would be interested to appear on our web portal? It will increase your visibility on internet, and provide good information for my users. Send me an email at greenty.com@gmail.com and I will try to answer within 24h.